UPDATE 2016-03-08: Mention ALL the projects we sponsored. We are now 2x carbon negative. UPDATE 2016-06-14: The Colorado contacted us and confirmed that they DO accept AmEx. This has been updated below and we have made a donation with them. Normally at our all-hands meetings we think about new CPR guidelines or other ways we can change the world. But this time a new idea floated up: could a small business like us become carbon neutral and how hard would it be? Admittedly this wasn’t very high on our list of priorities, especially considering how difficult it was to get started and we had no idea what it might cost. But with persistence we were able to make it happen and document the whole process. By skipping to the answers below maybe your company can make this socially conscience change and get it done a lot faster than we did! What is Carbon, Why Be Neutral? Here is the simplest graphic we found that explains our planet’s carbon ecosystem. Before industrialization and through hundreds of millions of years of balance, Earth created an atmosphere that supports animals, which need oxygen, and plants, which need carbon dioxide. 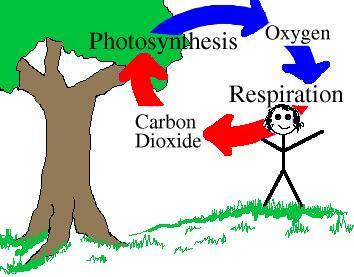 Basically animals breathe in oxygen and exhale carbon dioxide and then trees do the opposite. All of the natural things that happen in this world support and depend on this balance. But recently there has been a disturbing change. All the things that humans do generally upset this balance. Cutting down trees, burning things for fuel and the ways we raise livestock all add carbon dioxide to the atmosphere or remove the replenishment of oxygen. We have done these things with such reckless abandon that it is starting to impact Earth’s natural systems. Humans have a responsibility to understand their own personal contribution to this balance. And doubly so for industrial concerns, like businesses. We Don’t Burn Anything, How Much Carbon Does Our Company Use? tl;dr: a lot, but it is manageable. Our company is a high-tech education business. A lot of the people work from home using their computers and phones and we definitely don’t burn anything — on purpose anyways. But when you use electricity or commute to work, this does directly result in carbon emissions. Luckily it is pretty easy to find out how much. If you are a large company and have your own metered utilities it is dead simple to find your carbon usage. Just take each utility bill (in dollars, or units consumed) times a certain number and that is your carbon emission. We’ll give you all the math later. But our company is in a shared space, so we needed to do an electricity survey. Just write down the model number of everything that plugs into the wall and look up online how many watts it is, don’t forget the lights overhead! We added everything up and found THE NUMBER. We would love to share this number with you. But our competitors rip off our website, copy our products and actively call us on the phone digging for information. So I’m very sorry but we cannot tell you how many square feet we lease or how many servers we have. This article is mostly for small business but there are other calculators out there for big business and they can estimate the carbon impact of industry conferences and other large-scale items. 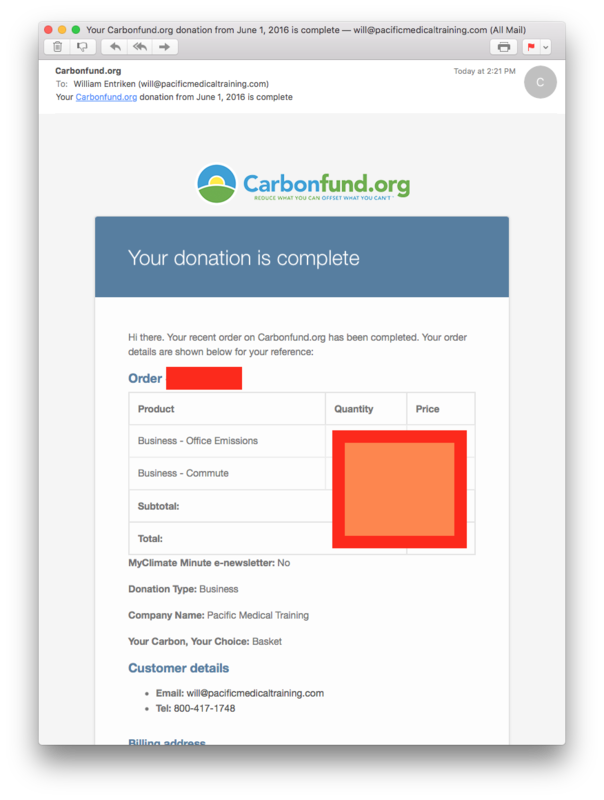 Be careful: many carbon calculator websites have buy buttons, read the next section before clicking them! We Emitted Carbon, So Now We Have to Stop Breathing? Through a process of OFFSETTING, your company can invest in a renewable energy generation or other carbon emission reduction project. The idea is simple: a bunch of people put up money (“credits” or “offsets”) and then use it to plant a bunch of trees or replace a coal electric plant with a solar one. So at the end of the day you still can still drive a car to work instead of walking, but the trees you planted eat that carbon for breakfast. And it all nets out to zero. Or in other words, you’re carbon neutral. And Who Plants the Trees for Me? An aside: if you (more likely your parents or grandparents) have a home phone line, you probably get lots of phone calls from “non-profits” asking for donations to save firefighters or needy children. Well a lot of those companies are complete scams. When researching how much carbon we produce, we saw lots of free calculators on lots of websites. Each one ended with a BUY button that promised to absolve us of all our sins. But always be careful before starting a new business relationship. First we called PECO, our local utility to see if they could recommend or directly sell us carbon credits. This led to a long list of transfers and redirections. I just want to emphasize that everyone was very helpful and willing to solve the problem. They even answered the phone promptly, which was a great surprise. But nobody answering the phone had heard of carbon offsets or carbon neutral before or received other calls about them. This is when I started taking notes and realized we need to blog about this. A second source we trust is the United States Environmental Protection Agency. They have a page and we reviewed each carbon offsetting program they discussed. Most of them are geared towards large companies and they promise to put your name on a specific project and they have people you can call to discuss your project. That is way too big for us! We reviewed each program and listed below the ones that have “buy now” buttons for small business. You can find a local project near you. Or you can invest in decommissioning coal plants on the other side of the world. Either way, you are going to breathe that air at some time. So research these projects and pick one you can get passionate about. Or tell us about other projects you have found! We looked at all the options and tried to decide among them. Then it happened. We decided to do all of them. That’s right… starting today, Pacific Medical Training is carbon negative! Technically, any carbon neutral company can just invest in one more project and then they become carbon negative. It sounds way cooler, you should totally do it. I am sorry that we cannot give you the exact number, but I can tell you that the cost to become carbon neutral is on par with our corporate budget for beverages. So if your company consumes as much as we do, now you know how easy it is to do so in a socially conscience way.